A summary of today’s show: Fr. Joseph Fessio tells Scot and Fr. Matt about the origin of the new YouCat youth catechism, which is not a replacement for the universal Catechism, but a formulation addressing the particular concerns of the young in new ways. They also discuss Pope Benedict’s very direct and surprising appeal to young people in the foreword to the YouCat. Finally, Scot and Fr. Mark discuss this Sunday’s Mass readings. 1st segment: Scot welcomes Fr. Mark back to the show. Scot said this is the 62nd broadcast of The Good Catholic Life. He said it’s been fun to learn more about his faith, to meet a lot of new people, and to get to know his co-hosts better than he had. Fr. Mark said it’s a blessing in his life as well. More and more people come up to him to say they’ve heard him on the radio. The other week a priest said to him, “I stole something from you that you said on the radio when you were on with Msgr. Connie McCrae.” Fr. Mark thinks it’s great. Scot thanks WQOM and all its benefactors for allowing him to broadcast The Good Catholic Life every day to the Boston area. Fr. Mark encouraged everyone to spread the good news of The Good Catholic Life, which is unique to Boston and it’s always current. 2nd segment: Scot welcomes Fr. Matt Williams and Fr. Joseph Fessio to the show. 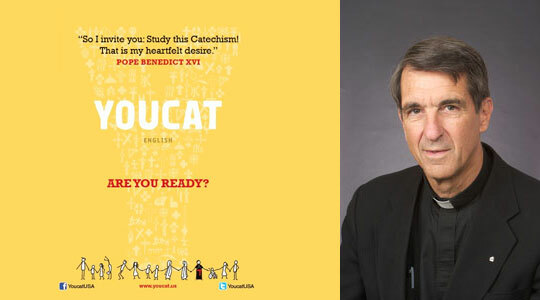 Scot said the YouCat is a new initiative for youth, a catechism designed to be youth-friendly. He asked Fr. Fessio how it’s different from other catechisms that are out there in the Church. Fr. Fessio said when the universal Catechism of the Catholic Church came out, the Holy Father, Bl. John Paul II, in his preface said that this was for the whole Church, but that there would have to be adaptations for different groups and different cultures and so on. This youth catechism is not only done for younger people, but also by younger people, collaborating in the effort. He was in Rome in April for the presentation to the Holy Father of the YouCat in 13 languages so far, and there was a reception that evening put on the Knights of Malta at their world headquarters. Cardinal Schönborn gave a description of how the catechism came about. One of the editors, a mother of six who’s a well-known writer in Germany, and one of the young people who was involved were there with Cardinal Schönborn. The cardinal was appointed by Cardinal Ratzinger back in 1987 to help oversee the preparation of the universal Catechism, which came out in the early 90s. But there was felt a need to have something a little shorter with a question and answer format and so they produced later, the Compendium of the Catechism of the Catholic Church and that was presented in Europe in 2005. Cardinal Schönborn was present for that release of the Compendium. At the press conference, a German publisher was there. A woman stood up in the audience and said to the cardinal that the Compendium is wonderful, but she wouldn’t buy it for her young children because they can’t understand it and she said they should create a catechism for young people. Cardinal Schönborn took that to heart and the German publisher, who was involved with a summer Catholic youth camp, asked if he could take the idea as a subject for the youth camp that summer. They brought in 50 young people—mainly high school and college age—and spent the whole week going over the Catechism of the Catholic Church and the Compendium, asking their questions and discussing things they needed to hear about. Then a team of writers—two theologians and two educators—got together for the draft of the new catechism. The next summer they had the same 50 kids back for another week, they went over the draft, took pictures, added elements to the sidebars, and that was what led to the YouCat. So back to what makes it different. While many catechisms are question-and-answer format, it has commentary—all based on the universal catechism—and sidebars with sayings of the saints, lots of graphics, a glossary of terms, and other supplementary materials. Plus the whole graphic layout is very attractive to young people. The only problem they’ve found is that it’s hard to get it into young people’s hands, because the old people get it and start looking at it, they get excited about it, and they won’t give it to their kids and are reading it themselves. Scot said that he found the quotes in the sidebars to be great. He’s never seen a better reference yet. Mother Teresa, St. John Vianney, and various recent Popes. That in itself is tremendous to take into holy hours and pray one of the 527 questions as well as the sidebars and explanations. He asked how the language used is different from the universal catechism to make it more appealing to youth. Fr. Fessio wouldn’t say it’s dumbed down. After all, it’s mainly a group of German kids working on this and they are pretty academically oriented, but it’s simplified. It’s readable, while challenging. In the preface, the Holy Father said it isn’t going to be easy, that there are hard sayings here and complicated things to learn, but it is adapted as much as possible for younger people. Scot said one of the neat parts he found were stick figures at the bottom and as you flip through the pages, they’re animated like in a flipbook. The stick figure is in a journey and at the end he’s walking with Jesus. Fr. Fessio said that’s exactly it and on the last page he jumps out of the book. He’s saying, now that we’ve learned our catechism let’s go out and live it. Scot said that aspect alone will be appreciated by some of the youth and hopefully that it encourages them to flip through the pages far more frequently and just stick on a question, stay and read it, and then think about it. 3rd segment: Young people were very involved in the production of this book. How specifically did they influence what the final product turned out to be? Fr. Fessio said it’s based on the four pillars of the Catechism: What we believe, how we worship, how we live, and how we pray. That was a parameter that was given by the nature of the Catechism. But they recognized certain areas—especially sexual morality—that they were particularly interested in and needed to know more about the Church’s teaching. They took all the pictures and illustrated it. They picked out all the quotes, which they thought would speak to themselves and other about whatever topics were treated on those pages. That was their main contribution. They also told those writing the catechism when they didn’t understand something and needed clarification. Fr. Matt said that it takes into consideration the concerns of today’s youth and young adults in a relevant way. He asked Fr. Fessio how he sees that playing itself out in YouCat, especially considering all the different cultures around the world it seeks to address. Fr. Fessio said that was part of the idea of this catechism. The central part, the Church’s teachings, would be the same for all countries, but the sidebar quotes and graphics would be done by the young people of those countries and there was a lot of leeway. Interestingly enough, what people found was that in no country—22 so far—did they want to make any substantial changes to the sidebar quotes and commentary. He thinks the Internet has changed our culture in such a way that there is a youth culture that is pretty common around the globe for kids who are pretty well-educated. From that point of view, it doesn’t need too much of the adaptation that was planned for it, although it’s always possible to do that. In India, they are very excited about it. When Fr. Fessio suggested they get some native Indian youths to participate in inculturating the catechism, they said it wasn’t necessary, that they’re using to seeing these things. They didn’t want to change. Secondly, it’s not a book to read from cover to cover. It’s more of a reference book and a guide. In fact, Ignatius even did a binding so it looks like a guidebook. They are in the process now of working with Ascension Press to prepare a confirmation program that would use this YouCat as the central reference for it. He’s told that’s one area of catechesis that’s weak in this country, that is the standard preparation for confirmation. As for young adults, they heard youth ministers say they wanted to prepare a guidebook for their use so that when they meet with young people, they can use YouCat with them. But then Midwest Theological Forum has received requests to prepare a marriage preparation course based on YouCat because a lot of the couples who come in to get married are fairly uncatechized. This can draw them into greater interest in the Church’s teaching. Fr. Matt said it does feel like a guide, tremendous resources being able to direct you the saints and other sources. He said he’s heard how Ignatius Press is looking to using social media to make this more available to young people. The average young people is engaged in some form of media about eight hours a day. What plans are there to use this in social media? Fr. Fessio said the Italians have put together apps for iPhone and Android—available very soon—that will give one question per day and the answer. They’re also going to create Facebook page and other social networking sites where young people can talk about their faith. They’re also planning to help train young people to catechize their peers using YouCat. Fr. Fessio thinks this will be a major focal point of catechetics for the next decade or so. Two very powerful analogies, but Scot was struck by his directness about knowing their faith better than their parents. He asked if Fr. Fessio was surprised by this directness? Scot said it seems like tougher talk than most poeple expect from the Holy Father, directly challenging the young people to study their faith, in this foreword. Scot hoped that the bold challenge from their father in faith, the Holy Father, will motivate young people to want to pick this up. They probably have not heard this Holy Father challenge them that directly. Study this Catechism with passion and perseverance. Make a sacrifice of your time for it! Study it in the quiet of your room; read it with a friend; form study groups and networks; share with each other on the Internet. By all means continue to talk with each other about your faith. That’s very direct! Why did he do that? Fr. Fessio said it’s the kind of person he is. Years ago, Fr. Fessio was a student along with then-Fr. Schönborn of then-Fr. Ratzinger at Regensburg, Germany, and that’s where Ratzinger met Schönborn and recognized Schönborn’s talent and what led to Schönborn becoming a bishop and then being appointed by Ratzinger to be in charge of the catechism itself. They’ve had a close relationship. Cardinal Schönborn said when he went to the Holy Father with this idea that the woman had proposed , the Holy Father was almost ecstatic and that it was exactly what was needed. He got behind it right from the beginning and put his whole weight behind it. This Catechism was not written to please you. It will not make life easy for you, because it demands of you a new life. It places before you the Gospel message as the “pearl of great value” (Mt 13:46) for which you must give everything. So I beg you: Study this Catechism with passion and perseverance. It’s not written to please the young people. It’s a gift to them, that gives them the teachings of the Church and through that come to understand what our destiny is in God’s love. Fr. Fessio said we’ve had two great Holy Fathers in a row and both of them have not been afraid to challenge people. We’re blessed to when we see the difficulties and evils in the Church in our time to have two leaders like this, both great intellects that are able to touch people’s hearts and able to engage people of all different ages and cultures. Many people say to me: The youth of today are not interested in this. I disagree, and I am certain that I am right. The youth of today are not as superficial as some think. They want to know what life is really all about. A detective story is exciting because it draws us into the destiny of other men, a destiny that could be ours. This book is exciting because it speaks of our own destiny and so deeply engages every one of us. So I invite you: Study this Catechism! Even at the end where he talks about the prophet Jeremiah and encourages them to see and understand their place in the Church and not to say that they’re too young, but they have an important role in the life of the Church now; not to underestimate themselves. Fr. Fessio said both of these popes have had great gifts of intellect and expression. When he speaks you want to listen and you want to go and do what he tells you to do. Scot said the lead-up to the publication of the YouCat was much more understated than the release of the Catechism in the early 90s and even the Compendium after that. Is the word just getting out? Did we want to tie the launch of this to World Youth Day and that’s one of the reasons we maty not have heard as much about it as we will? Fr. Fessio said it’s a good question and he doesn’t know the answer to it. He knows that when Ignatius was asked to be the English-language publisher, he was interested but they thought it was just going to be another catechism for young people. But when they got the German original, with all the graphics and layout, they all got excited about it. The word has come out only because people have gotten to know what it really is and as they see, it’s not just another book and another catechism, but something amazing. People are getting excited about it. Ignatius was cautious about it. They only printed 15,000 copies in the first printing, and sold them out in the first week. They did another printing of 10,000 and sold those out. They’re printing 20,000 more now. It’s catching on. Scot asked Fr. Fessio if there’s anything else about the YouCat that listeners should know. He said go to Ignatius.com to get it online. 5th segment: Scot returns with Fr. Mark to discuss the Gospel reading for this coming Sunday. The readings for this week are for the 7th Sunday of Easter. Some parishes in the listening audience will be celebrating the Feast of the Ascension, which was moved from last Thursday in some dioceses. Jesus raised his eyes to heaven and said, “Father, the hour has come. Give glory to your son, so that your son may glorify you, just as you gave him authority over all people, so that your son may give eternal life to all you gave him. Now this is eternal life, that they should know you, the only true God, and the one whom you sent, Jesus Christ. I glorified you on earth by accomplishing the work that you gave me to do. Now glorify me, Father, with you, with the glory that I had with you before the world began. Scot said a unifying aspect of these readings is that they’re about prayers. When the Apostles return to the upper room, they pray, surrounding the Blessed Mother. Then we read in the Gospel that Jesus Himself prays for each of us. If Jesus prays and the Blessed Mother prays and the Apostles pray together, then it makes Scot want to evaluate how often he prays. He tries to pray every day, but does he make it a central part of his day. It should always be a central part of his day. Fr. Mark said this is a particularly important moment in the Church year. The time between the Ascension and Pentecost. That’s when we pray specifically for the coming of the Holy Spirit in a new way in our life. The Apostles and Mary were in that room. They were still troubled—even though they’d seen the Risen Lord and had seen the Ascension. Soon Pentecost comes and the Holy Spirit comes and it relieves that trouble. God begins to work new things in their lives and that happens to us too. Scot said the Gospel readings call us to a deep sense of prayer, not just where we go by a church and sit by the Blessed Sacrament or kneel beside our bed and just ask God for things. The kind of prayer talked about here can involve that, but it involves a really deep relationship, a deep friendship, a deep communion with Jesus. As we saw the Apostles, those who were his friends, they surrounded the Blessed Mother and through her intercession and maternal care, their prayers were deepened because the Blessed Mother helps us know her son. Fr. Mark said it’s also a deep discerning prayer. We discern with the Blessed Mother helping us, she intercedes for us. We can go to her for help in discerning where God is calling us. Where are we being asked to go with our life in the Holy Spirit. Scot said the Church universal should be praying that we all receive—collectively and individually—gifts of the Holy Spirit to be more effective at what God calls us to be. We’re called to similar things: to share our faith with others, to live our faith the best we can every day. We’re also called in a particular to be the best we can be with the blessings and talents God has given to us. Sometimes we’re not fully aware how our talents can serve the Church more effectively, our families, our friends, our communities. Praying for the gifts of the Holy Spirit to understand how to utilize our gifts and if we’re called to a specific ministry to be gifted even more to carry out that ministry. That’s what we should be praying for as we come to Pentecost next Sunday. Fr. Mark said this Gospel gives us what it’s all about too. That prayer, that hard work of doing Jesus’ will, is about being glorified as Jesus was glorified. There’s a beautiful reflection that Jesus gives us about being glorified by the Father. C.S. Lewis wrote a very good essay called “The Weight of Glory” in which he tells us the end result is to be child-like in front of God, basking in God’s praise. That is the result in that we can meet God face to face in heaven and God is pleased with us because of our good work. He says, “Come in my good and faithful servant.” That’s what glory is all about. That’s why we work and why we pray: to be glorified as Jesus was glorified by the Father. Scot has heard some priests relate that people say, “Father, I’d really like to pray more. I just don’t have time.” And the priests then ask them how TV they watch, how much of the newspaper do they read. We can always make a decision to spend more time with God. 99.9% of us can find more time for prayer. Through the wisdom in prayer and the communion with our Lord, whatever problems we face, he’ll help carry the burdens with us. We focus everyone listening to the show to focus more on prayer this week. Fr. Mark added that you don’t start off as a mystic when you want to pray. You start off as a person who struggles with 10 minutes. So give God 10 minutes.